The first half of the 17th century in Belarus was marked by the advent of many churches. The Dominican monastery (1622), the Basilian convent of the Holy Trinity (1630), the Bernadine convents (1628, 1642) were opened in Minsk.The history of The Cathedral of the Holy Ghost dates back to 1633-1642 when the convent was built to serve the Bernadine nuns. In 1652, the conventual building was made of stone. 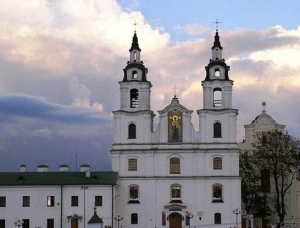 But the convent's consecration was delayed for about 40 years due to the Muscovite invasion.In 1741, on account of fire, the original structure of the building was damaged then reconstructed. In 1852, the convent was abrogated and moved to Nesvizh. The building was given to the Russian church for use as a monastery. But half a century later it was closed again by the Bolsheviks.Today the church is open. It's a great repository of icons by Moscow Academic School. The most precious icon though is a wonder-working Icon of the Mother of God discovered in Minsk in 1500.This icon is also called Icon of Minsk. But for many centuries, the icon was outside the city, even outside Belarus at all. The history of this marvellous image goes back to evangelic times. By legend, it was made by St. Luke the Evangelist. In the course of many years, the icon was kept in Byzantium. On the eve of the Baptism of Russia — more than a thousand years ago — the Kievan Grand Duke Vladimir brought the Icon of the Mother of God to Kiev where it was for five centuries.During the Tatar horde, one of the Tatars threw the icon in Dnieper having taken off the decorations. Nevertheless, the icon survived and appeared on the Svisloch River where it was found by 'extraordinary shine'.